This tour will give you the perfect opportunity to explore both our unique culture and our vast array of nature. From the moment we leave Port Tauranga, your senses will be overloaded with New Zealand's natural beauty and rich culture. You will be wowed as we drive to Rotorua, travelling through beautiful farmland and passing through the inspiring Pyes Pa Canyons, an incredible man-made piece of roadway. Along the drive, we usually stop by the Agrodome and Agroventures playground to try to catch a glimpse of New Zealand's local sheep and any other animals which may be out in the fields. Our first stop is at the lakes in the centre of Rotorua city. Here, you can walk around the lakes and take in the amazing palette of colours presented to you from both the hot, thermal steamy lakes as well as the cold lakes which are incredibly situated side by side. After a brief stroll around this beautiful spot, we continue on to immerse into Maori culture. After having taken in the breathtaking view of the lakes in the centre of Rotorua city, we arrive at Te Puia NZ Moari Arts & Crafts Centre where we will guide you around the Whakarewarewa Thermal region. 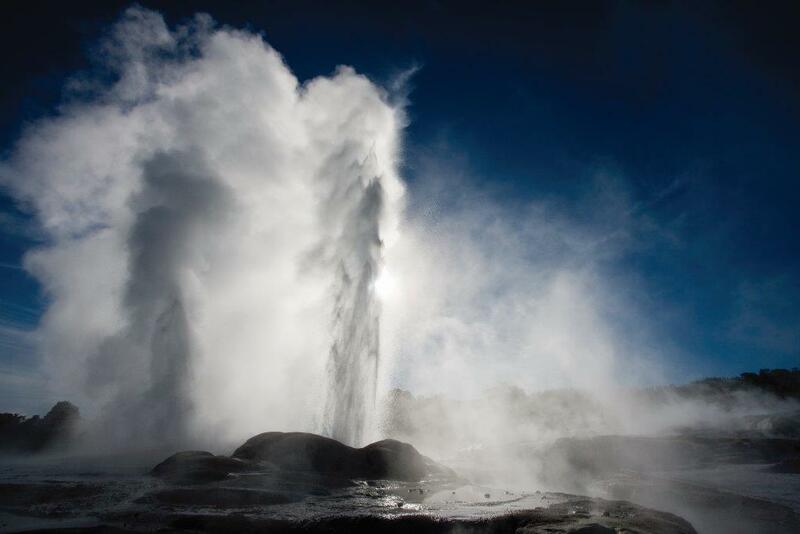 Here, you can experience Pohutu Geyser which not only spurts up to twenty times a day but also has the ability to spurt up to thirty feet in the air!, as well as seeing the mind-blowing bubbling mud and steam vents. We will then pop into the Kiwi House where you’ll be able to spot the native Kiwi, our iconic, flightless bird. It’s worth noting that the Kiwi is prone to extinction unless we continue with breeding programmes and pest eradication. Having seen the incredible natural beauty around the Whakarewarewa regions, we will move on to experience a Maori cultural traditional performance. Every day at Te Puia, you get to hear ancient and modern stories through song, dance, poi and stick games. In earlier times, these activities served as agility and coordination training for our Maori warriors. After the performance, we will take you to a nice spot for lunch either in downtown Rotorua city or along the lakefront. Before departing the friendly and local city of Rotorua, we will visit the formal Government Gardens, the famous, historic Bath House, the Art Deco Blue Baths and Rachel’s pool. We will then begin our journey back to Tauranga, but this time we will take a different route so you can experience as much of the region as possible. Time permitting, we’ll pass through native New Zealand forest and farmland, stopping at the awe-inspiring Kaituna Waterfalls and then at Kiwi 360 to discover more about the Kiwifruit industry. Here you get up close under the vines, learn about the amazing health properties of this little berry, taste various products from this fruit, and ladies - it’s probably your only opportunity to shop on this action-packed tour! We will then continue our journey to Port Tauranga to get you back to your ship at 4pm.